Explanation: Tonight brings the last total lunar eclipse visible from North America until the year 2000 - with the Moon becoming completely immersed in Earth's shadow. 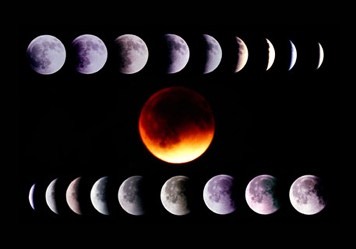 The above time-lapse photograph shows a lunar eclipse that occurred in April 1993. Tonight's eclipse will begin at 8:12 pm Eastern Daylight Time, with totality extending from 10:19 pm to 11:29 pm. In North and South America, the Moon will be just rising at the beginning of the eclipse. In West Europe and Africa, tonight's lunar eclipse will be visible before the dawn of September 27th. The Moon is not expected to become completely dark - usually it has a slight red glow caused by sunlight refracted through the Earth's dusty atmosphere - but every lunar eclipse is slightly different. This year's eclipse will be enhanced by the proximity of bright Saturn just 3 degrees away.